The Armenian Patriarchate of Constantinople went through turbulent times in the mid-nineteenth century, when there were heated disputes over the democratization of the Armenian society and the Church. The name of Patriarch Nerses Varjabedian emerged in the 1870s-1880s as a guiding light. The future ecclesiastic was born Boghos Varjabedian in the district of Haskeuy (Constantinople) on January 28, 1837. He studied at the Nersessian School, in his neighborhood. At the age of fifteen he lost his father and became, as the eldest son, the main support of the family. He was sixteen in 1853, when he returned to his alma mater as a teacher. He moved to Adrianople (now Edirne) two years later. The local prelate, Bishop Aristakes Raphaelian, took the young teacher under his wings and in 1858 ordained him as a celibate priest (vartabed) with the name Nerses. A year later, he returned to Haskeuy as pastor, becoming the standard bearer of a spiritual and intellectual renaissance in his birthplace. In 1861, on recommendation from the Patriarchate, he was sent as a preacher first to Romania and then to Transylvania (presently in Hungary). He was ordained a bishop in 1862. He participated actively in the struggle that led to the adoption of the National Constitution (Ազգային Սահմանադրութիւն/Azkayin Sahmanatrootyoon) in 1860 and the approval of its modified version by Sultan Abdul Aziz in 1863. 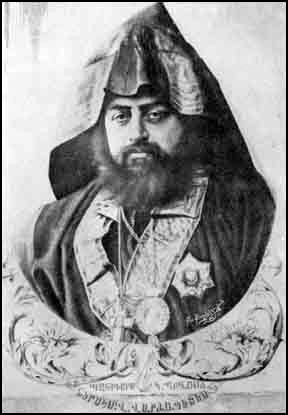 In 1866 he participated in the election of Catholicos of All Armenians Gevorg IV in Holy Etchmiadzin. In 1862 he was elected prelate of Nicomedia (Ismid). Two years later, he published his first book, The Holy Church of Christ and Her Opponents. Patriarch Megerdich Khrimian (Khrimian Hayrig) resigned his position after a five-year tenure (1869-1874). Despite his youth (he was thirty-seven at the time), Bishop Nerses Varjabedian, enjoyed general respect and authority, and was elected Patriarch on April 26, 1874. In 1875 he published his second book, Teaching of the Concordance of the Gospel of Our Lord. The latter was a combination of the four Gospels, with explanations and reflections in both Classical and Modern Armenian. It was used for a long time as a school textbook. During his ten-year tenure, the Religious Council normalized its activities and established a minimum age to confer religious degrees. Patriarch Nerses participated in the activities of the Armenian United Society, an educational organization that worked towards the education of Armenians in the interior of Turkey. In the 1880s he would be the driving force behind the foundation of the Getronagan School in Constantinople (founded after his death, in 1886). After the victory of Russia in the Russo-Turkish war of 1877-1878 and the favorable conditions created for the Armenian Question, the Patriarch presented a petition to Czar Alexander II, asking him to protect the Western Armenians. He worked together with the National Council of Constantinople to enter article 16 in the Treaty of San Stefano, which established the need of reforms for the Armenians in the Ottoman Empire under the guarantee of Russian occupation, as well as the cession of Western Armenian territories to Russia. He also organized and sent an Armenian delegation led by Khrimian to the Congress of Berlin. In 1879 he unsuccessfully addressed the European representatives to carry out reforms in Armenia and the British ambassador to have the Ottoman Empire comply with article 61 of the Treaty of Berlin. His memoranda to the Sublime Porte (the name of the Ottoman court) also remained unanswered. In 1884 Varjabedian was elected Catholicos of All Armenians, but he resigned due to his poor health. He died on October 26, 1884, in Constantinople, at the age of 47, victim of diabetes.